I will probably always be a little squeamish about butchering big hunks of meat and fish. The texture is the immediate problem, then there’s the fact that I attempt to remove every single mildly offensive bit off the cut, which isn’t always possible (or even desirable, depending on how it might break down under heat). I’ve been wrestling with breaking down whole chicken quite a bit lately, and still have a lot of room for improvement, but I’ve never attempted to break down a huge hunk of fish before. We aren’t fishermen, and the few times we’ve purchased whole fish, I cook it whole and let my husband serve it up around the bones. This time what he brought home from the store was just a big hunk of halibut, and it seemed necessary to butcher it into more usable pieces. While doing so, I took a moment to admire its two-tone skin, which I usually don’t get to see. 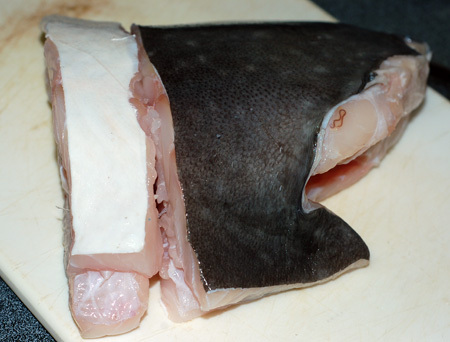 Halibut is a flatfish, so the one side (ie: the “top”) is dark gray and the other is white. 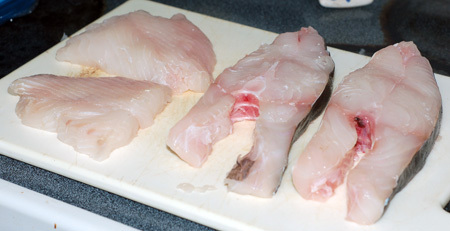 I cut my chunk of halibut into two 1″ skin-on steaks and two small boneless fillets, both with their challenges. The steaks were difficult to cut because that spinal bone is pretty darn large; I ended up using a cleaver and taking it on faith that I would be able to repeatedly hit the same mark and not mangle the meat. For the most part, it worked out. As for the fillets, I just used my boning or fillet knife (which doesn’t see a lot of action, let me tell you), and carefully sliced around the ribcage and bony dorsal fin remnants. I could use a lot more practice doing this, as I was not able to get quite all the meat off together. Some ended up staying on the bones and went in the freezer for making fumet sometime later. I was then able to skin the fillets pretty easily, but that I’ve had some practice with before: you lay the fillet skin-side down on the cutting board and make a slice just between the skin and flesh deep enough for you to grip the skin, then just hold your very sharp knife flat angled slightly down onto the cutting board, and wiggle the fish backward against the knife blade. The weight of the fish against the blade will be enough to slice the skin without hacking into the flesh, and you’ll remove the skin without damaging the fillet. I decided to cook up the steaks first. When I make fish, the first recipe I always think of is my favorite white wine-scallion sauce, which is incredibly simple and flavorful. Luckily, I had purchased a bunch of tiny spring scallions from the farmer’s market a few days before, but I had to make some adjustments because we are out of white wine. I used lemon juice instead, and then tempered the sauce with a splash of cream because I’m not a huge fan of strong lemon flavoring. The steaks were simply seared and finished in the oven, and I removed the skin before serving. They tasted very good, but I didn’t trust my butchery and was very concerned about the number of fishbones, so it was hard for me to enjoy this meal. My oven died the day after baking up those steaks, so the fillets had to wait two days for the new oven to be installed. I decided to do a remix of some of the same ingredients, and made up a roasted tomato-dill cream sauce for the fillets and a scallion vinaigrette for the salad to use up my last handful of green onion tops. We’ve been buying organic artisan lettuce at Costco, and I always welcome a change of pace in the dressing department. 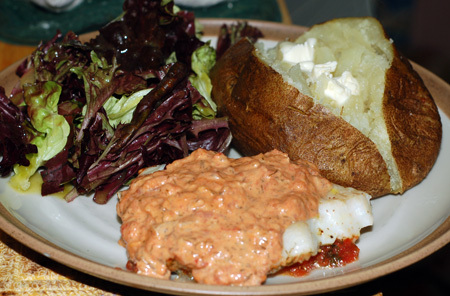 The tomato sauce I cobbled together was delicious, and we only wished there was a bit more fish to go with it. If you are making the scallion sauce: Melt butter in a small skillet and add the sliced green onion and white wine. (Reserve the onion tops to make a scallion vinaigrette for salad.) Simmer over medium heat until the wine has reduced almost to a glaze. Add cream, if desired, and heat through; taste and adjust for seasoning. Pour over fish and serve. If you are making the tomato-dill sauce: Pour the drained tomatoes, onion, garlic, and dill in a small casserole or roasting pan. Season with salt and pepper, and toss with a drizzle of olive oil. Roast for about 30 minutes at 400F, until the vegetables are tender and beginning to caramelize. If desired, add the fish to the vegetables for the last 10 minutes or so of cooking, and bake until cooked through and flaky. Remove the fish to covered serving dish, if necessary, and spoon tomato mixture into a small skillet; add cream and simmer until heated through and slightly reduced; use a stick blender to puree slightly, leaving some texture. 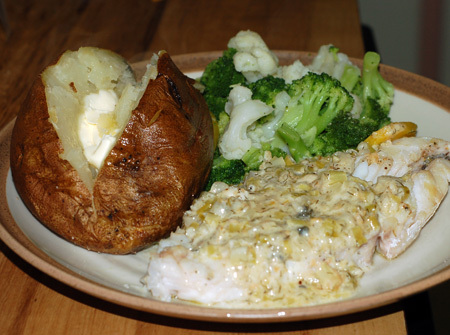 Taste and adjust for seasoning, and serve over fish. Place first 6 ingredients in a blender and process until homogenous. Slowly pour in oil as the blender runs, to emulsify the dressing. Serve over lettuce or spinach salad; would also be delicious served with a corn or bulgar salad.